What to bring: Bring usual hashing gear-- dry shoes and socks and clothes, a few of your closest friends, a camp chair, a hearty thirst for good beer, a healthy appetite for orange food, a sense of humor and a song for circle. Bring water! 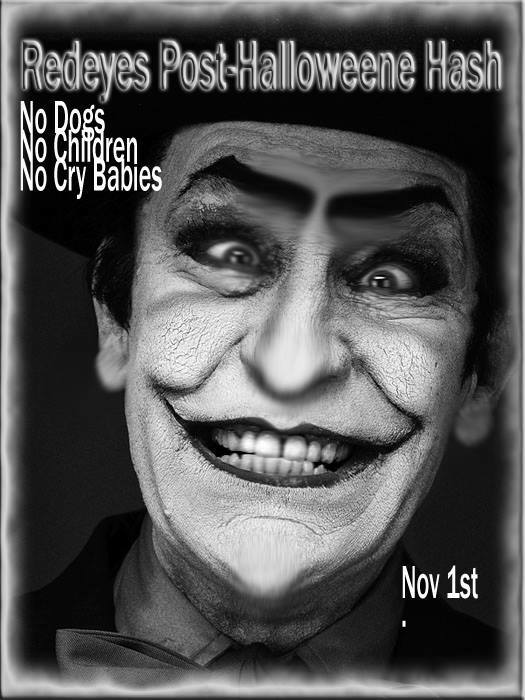 "No Dogs, No Children, No Cry Babies.."
Look for hashers still wearing makeup from last night…recounting their many bad decisions. We need hares for the following dates: November 29 and all of December. Email Star Whore at terrinh73(at)gmail(dot)com to sign up!! !